If you've ever ridden in a group and been dropped (I think we all have), then you know what it's like to want to go faster, climb better, descend quicker and clear every obstacle in the path. Using your brakes requires you to use your head, especially when descending. No, not as a stopping block it means using your best judgment on how much or how little to squeeze those brake levers. The more weight a tire carries, the more braking power it has. When going downhill, your front wheel carries more weight than the rear. Braking with the front brake helps keep you in control without going into a skid. Be careful, though, not to overdo it and accidentally toss yourself over the handlebars. And don't neglect your rear brake. When descending, shift your weight back over the rear wheel, thus increasing your rear braking power as well. This balances the power of both brakes and gives you maximum control. Good riders learn how much of their weight to shift over each wheel and to apply just enough braking power to each brake, so not to "endo" over the handlebars or skid down a trail. Shift into a low gear. Before shifting, ease up on your pedaling to decrease pressure on the chain. Find the gear best for you that matches the terrain and steepness of each climb. Stay seated. Standing out of the saddle often helps when climbing steep hills with a road bike, but you may find that on dirt, standing causes your rear tire to lose its grip and spin out. Climbing requires traction, especially in loose terrain. Stay seated as long as you can. Lean forward. On very steep hills, the front end may feel unweighted and suddenly pop up. Slide forward on the saddle, and lean over the handlebars. This adds more weight to the front wheel and should help keep you grounded. Keep pedaling. On rocky climbs, keep the pressure on, and don't let up on those pedals. The slower you go through rough trail sections, the harder you will work. Shift into the big chainring. Shifting into the big ring before a bumpy descent will help keep the chain from bouncing off. And should you crash or disengage your leg from the pedal, the chain will cover the teeth of the big ring so they don't bite into your leg. Relax. 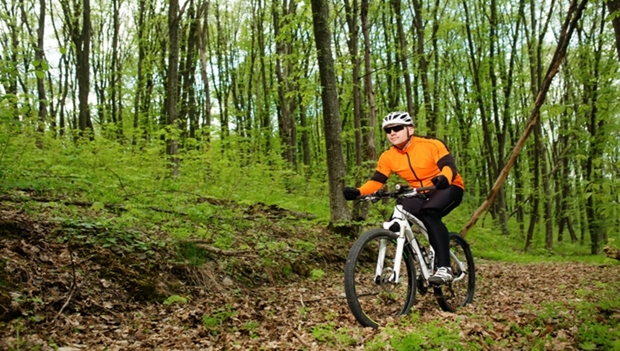 Stay loose on the bike, and don't lock your elbows or clench your grip. Your elbows need to bend with the bumps and absorb the shock, while your hands should have a firm but controlled grip on the bars to keep things steady. Steer with your body, allowing your shoulders to guide you through each turn and around each obstacle. Don't oversteer or lose control. Mountain biking is much like downhill skiing, since you must shift your weight from side-to-side down narrow, bumpy descents. Your bike will have the tendency to track in the direction you look and follow the slight shifts and leans of your body. You should not think so much about steering but the direction in which you wish to go. Rise above the saddle. When racing down bumpy, technical descents, you should not be sitting on the saddle but instead standing on the pedals and straddling the seat, allowing your legs and knees to absorb the rocky trail instead of your rear. Drop your saddle. For super steep, technical descents, you may want to drop your saddle 2 or 3 inches. This lowers your center of gravity, giving you more room to bounce around. Keep your pedals parallel to the ground. The front pedal should be slightly higher so that it doesn't catch on small rocks or logs. Stay focused. Many descents require your utmost concentration and focus just to reach the bottom. You must notice every groove, root, rock, hole and bump. You, the bike and the trail should all become one as you seek singletrack nirvana on your way down the mountain. If your thoughts wander, then so may your bike, and into those trees you will go.